Prof. Dr. Ben Juurlink received the M.Sc. degree from Utrecht University, Utrecht, The Netherlands, and the Ph.D. degree from Leiden University, Leiden, The Netherlands, in 1992 and 1997, respectively. In 1997-1998 he worked as a post-doctoral researcher at the Heinz Nixdorf Institute in Paderborn, Germany, and from 1998 to 2009 he was a faculty member (first assistant professor, then associate professor) of the Computer Engineering Laboratory of Delft University of Technology, Delft, The Netherlands. Currently, he is professor for Embedded Systems Architectures in the Faculty of Electrical Engineering and Computer Science of Berlin University of Technology, Berlin, Germany. He is also co-founder of Spin Digital GmbH. Dr. Juurlink’s research interests include multi- and many-core processors, reconfigurable computing, and the art of mapping applications effectively and efficiently to computer architectures. He has (co-)authored more than 130 articles in international conferences and journals, and received best paper awards at the IASTED International Conference on Parallel and Distributed Computing and Systems (PDCS) in 2002, and at the third IEEE International Conference on Consumer Electronics – Berlin (ICCE-Berlin). He has also received a Technology Transfer Award from the HiPEAC Network of Excellence for transferring some of the video coding technology that has been developed in his group to a Greece-based SME. Dr. Juurlink is a senior member of the ACM and a senior member of the IEEE. He has been the Principal Investigator of several national research projects, Work Package leader in several European projects, and Coordinator of the EU projects LPGPU, Film265, and LPGPU2. He has served on many program committees, is an editor of the Elsevier journal on Microprocessors and Microsystems: Embedded Hardware Design, and was the general co-chair of the HiPEAC conference in 2013. Cor Meenderinck and Ben Juurlink (2011). Nexus: Hardware Support for Task-Based Programming. Digital Systems Design, Euromicro Symposium on. IEEE Computer Society, 442-445. Arnaldo Azevedo and Ben Juurlink and Cor Meenderinck and Andrei Terechko and Jan Hoogerbrugge and Mauricio Alvarez Mesa and Alex Ramírez and Mateo Valero (2011). A Highly Scalable Parallel Implementation of H.264. Transactions on High-Performance Embedded Architectures and Compilers IV. Springer Berlin Heidelberg, 111-134. Madhavan Manivannan and Ben Juurlink and Per Stenström (2011). Poster: implications of merging phases on scalability of multi-core architectures.. ICS. ACM, 380. Michael Andersch and Chi Ching Chi and Ben Juurlink (2012). 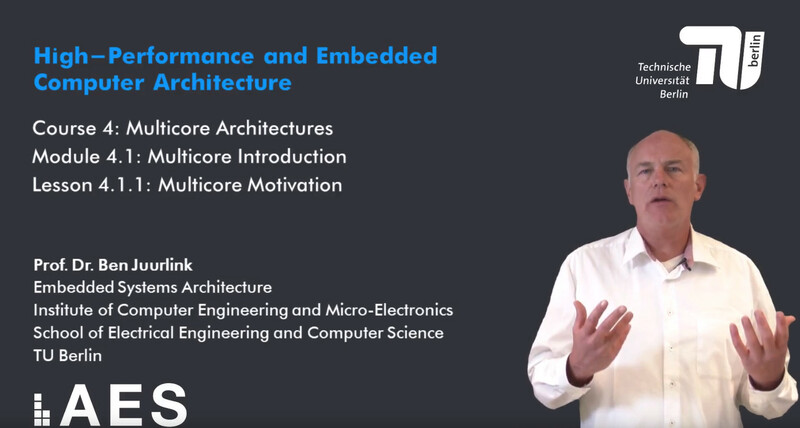 Programming Parallel Embedded and Consumer Applications in OpenMP Superscalar. Proceedings of the 17th ACM SIGPLAN symposium on Principles and Practice of Parallel Programming. ACM, 281–282. Gervin Thomas and Karthik Chandrasekar and Benny Akesson and Ben Juurlink and Kees Goossens (2012). A Predictor-Based Power-Saving Policy for DRAM Memories. Digital System Design (DSD), 2012 15th Euromicro Conference on, 882 -889. Ben Juurlink and C. H. Meenderinck (2012). Amdahl's law for predicting the future of multicores considered harmful. SIGARCH Comput. Archit. News. ACM, 1–9. Ben Juurlink and Mauricio Alvarez-Mesa and Chi Ching Chi and Arnaldo Azevedo and Cor Meenderinck and Alex Ramirez (2012). Scalable Parallel Programming Applied to H.264/AVC Decoding. Springer. Tamer Dallou and Ben Juurlink (2012). Hardware-Based Task Dependency Resolution for the StarSs Programming Model. 41st International Conference on Parallel Processing Workshops (ICPPW), SRMPDS'2012, 367 -374. Further Publications of Prof. Juurlink are here available.